DERIVATION: probably from the Greek xiphias for "swordfish" or ziphos for "sword," and from Greek cavus for "hollow or concave" in reference to the deep hollow basin before the nostrils or blowhole in the skull that is a diagnostic trait of the species and from the Latin rostrum for "beak." In 1823, a French anatomist, Georges Cuvier, mistook a skull fragment for a fossil and described what he believed to be an extinct species of whale. 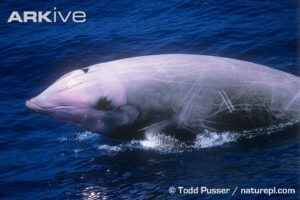 Several decades after his death, it was learned that Cuvier's beaked whale was an existing living whale found in the offshore waters of all the world's oceans. Physical Characteristics: Cuvier's BW have a long and robust body with a relatively small head. Maximum length in males is 32 ft (9.8 m) and in females is 28 ft (8.5 m). Maximum recorded weight is 6,600 lb (3,000 kg). At birth, a calf's length is about 9 ft (2.7 m) with weight 500-660 lb (250-300 kg). Their beak is short and poorly defined with a smoothly sloping forehead. The beak becomes less distinct with age, while their forehead (or melon) becomes more prominent, even bulbous, in adult males. Cuvier's unusual mouthline curves along its length with an upturn at the rear. This strange outline, combined with the profile of the head, produces an appearance that has been compared to a goosebeak. Distinct features of adult males are two large, cylindrical teeth located at the tip of the lower jaw and the lower jar extends beyond the upper. Female teeth are slender and pointed and normally do not pierce the gum. Males have more massive conical teeth that erupt early in life and are not concealed by the upper jaw. Their teeth may be infested by stalked barnacles. Their skin color varies greatly among individual whales and therefore cannot be used as an identifier. Their color lies between dark gray and rusty brown or fawn colored with lighter areas around the head and belly. As they age, particularly males, the head, neck and back become lighter and some male heads are entirely white. Their eyes are usually surrounded by dark coloration and there may be light crescent-shaped streaks around the eye area. Calves are dark above and light below. Extensive linear scarring may be present, but is more common in males. The cause is assumed to be males fighting for females, but this has never been observed. Both sexes often have white oval scars that are most likely inflicted by lampreys or cookie-cutter sharks. Flukes are reasonably large and a fluke notch is not always present. Dorsal fin is small and falcate, and is on the back approximately two-thirds away from the snout tip. "Flipper pockets" are slight depressions where the small, rounded flippers can be tucked and kept flush with the body, presumably for hydrodynamics. Life Cycle: Sexual maturity occurs at around 20 ft (6.2 m). Seasonality of calving is unknown. Their life history is not well known. Feeding: They seem to prefer feeding in deep water on deep-sea squid, as well as fish and some crustaceans. Apparently, they feed near the bottom and in the water column. Behavior: A Cuvier's BW may raise its flukes as it begins its deep vertical dive which may last up to 40 minutes. Their blow may be low, slightly forward and to the left. It is often inconspicuous, even after a long dive. Distribution: Cuvier's BW are widely distributed in offshore waters of all oceans, from tropics to polar regions. They are found in many enclosed seas, like the Sea of Cortez, Gulf of Mexico, Caribbean Sea, Mediterranean Sea, and the Sea Okhotsk. Of the 21 BW species, they have the most cosmopolitan range. Threats and Status: They are a somewhat abundant marine mammal with widespread distribution found in small groups of 2-7, but often seen alone. Never a target of commercial whalers, they have sometimes been taken in other fisheries: Caribbean Islands, Indonesia, Taiwan, Peru and Chile. A few were taken in previous years by the Baird's BW fishery off the coast of Japan. Occasionally Cuvier's have been trapped in deep water drift gillnets. Killer whales (Orcinus orca) are probably a threat to Cuvier's. Sonar Testing: Mass mortalities of Cuvier's BWs have occurred after Naval sonar exercises in many parts of the world: Bahamas, Caribbean, Canary Islands and the Mediterranean. They appear to be particularly vulnerable to testing, and the syndrome is apparently induced by exposure to mid-frequency sonar signals and largely affects deep, long-duration, repetitive-diving species like all BWs. There does not seem to be enough evidence to isolate Cuvier's BW from the other species of BW, and larger mortalities may be attributable to a higher abundance of this species in the affected areas. About four hours after international naval exercises began using mid-frequency sonar in the Canary Islands, a mass stranding of whales began. Macroscopically, whales had severe, diffuse congestion and hemorrhage, particularly around acoustic jaw fat, ears, brain and kidneys. Severely injured whales died or became stranded and died due to cardiovascular collapse during beaching, apparently induced by exposure to mid-frequency sonar signals. There may be an increase in bubbles in the blood causing decompression sickness (such as occurs in decompression sickness with human divers) when returning to the surface from a deep dive.